Good morning! 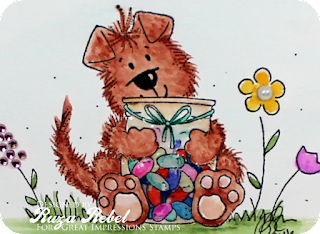 Ruza here to share a Easter card featuring H284 Jelly Bean Time, B252 Border of Jelly Beans, and E890 Life is Sweeter Sentiment, available at the Great Impressions Stamps. I stamped the adorable Jelly Bean Time on white cardstock with Memento Tuxedo Black Ink. Since I stamped the image a week before coloring, I water-colored the image using my Marvy Markers. After cutting the image down to size, layering it onto some design paper and then to my panel, I added the Life is Sweeter Sentiment, which I split up, above and below the image. I then applied Glossy Accents to the jar of Jelly Beans, and added some bling to the flowers and each corner. It's so much fun making coordinating envelopes for my cards and the Border of Jelly Beans is a perfect match for today's card. Don't you just love this Jelly Bean Time stamp? I know I do! Great Impressions is this weeks Sponsor for the C.R.A.F.T. Challenge #356, Add Some Bling. Hop on over to check out the details for another awesome chance to win some amazing Great Impressions stamps for yourself! Happy Easter from all of us here at Great Impressions!